Hao Jingban, Forsaken Landscapes (still), 2018, HD two-channel video, color, sound, 33 minutes 21 seconds/18 minutes 50 seconds. 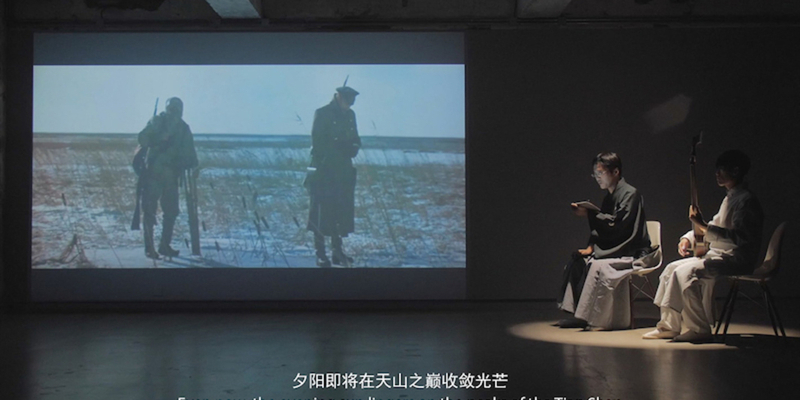 Beginning with a melodic performance by a Japanese benshi (a live narrator for silent films) accompanying a video collage of landscapes in and around the formerly Japan-occupied Manchuria, Hao Jingban's latest exhibition presents itself as a “foreign object”-a term used by the benshi when describing his vocation. This object attempts to rediscover a piece of lost cultural memory, lest silence lower that past into the grave, as Hao says in one of her videos. As the first edition of Hao's ongoing research on the Manchukuo Film Association Ltd. (or Man'ei)-a Japanese propaganda-film company in occupied Manchuria during the 1930s and 1940s that now stands as an important yet forsaken early chapter of Chinese film history-“Uninvited Guest” borrows fragments from films, writings, and oral accounts to trace possible routes into this cinema. Loosely dividing its space into three scenes and story lines, the exhibition documents and wanders through a land of shifting sovereignty and dogma. The episodes include the aforementioned shots of northern landscapes; examples of choreography under different rulers; a theater of two competing characters, both played by a Japanese-born, American-raised, and China-based actor who can be seen in numerous contemporary Chinese anti-Japanese TV dramas as the “Japanese invader”; and a videotaped promenade around the former film-company building, now the Changchun Film Group Corporation, the footage paired with Hao's soft yet steady rambling on its past. In Man'ei's fragmented history, one may begin to sense echoes of Japan's “Greater East-Asia Co-Prosperity Sphere,” which rivaled today's ambitious development plans in China. Ultimately, Hao and her collaborators present a series of video essays whose individual tales are as ambiguous as the national memories they leave only-and crucially-half summoned.